Nutrition is a broad topic that includes the components of food, food intake, what happens to the food once in the body, elimination of the residue, and how nutrients are related to health and disease. Research, education, and advertising combine to bombard the public with massive amounts of information or misinformation on what to eat, how much, and when. A strong understanding of nutrition will help people make better and healthier choices about nutrition. Foods can confer health benefits beyond their nutritional value. A nutrient is an ingested chemical that is absorbed and made part of the human tissues. Substances in the food that are not absorbed are not considered nutrients, but may nevertheless be essential to one's health, such as dietary fiber. A chemical need not be digested (chemically modified) to be considered a nutrient. Water, vitamins, minerals, and cholesterol are all important nutrients, for example, that are absorbed into the tissues without requiring chemical breakdown. Foods can confer health benefits beyond their nutritional value. For example, fiber helps prevent colon cancer, and cranberries and blueberries promote urinary tract health. Nutrients include macronutrients (carbohydrates, lipids , proteins, and water) that are consumed in large quantities and micronutrients (vitamins and minerals) that are consumed in much smaller quantities, although they are no less essential to health. The macronutrients provide raw material for building tissues, as well as energy. The energy stored in the nutrient is measured in kilocalories (simply called calories in dietetics). A positive energy balance means one is consuming more kilocalories than one is using; the excess stored mostly as fat. A negative energy balance means that one is "burning" more calories than are being eaten; this results in weight loss. Carbohydrates are the most important source of quick energy, but they also function in cell-membrane structure. They include the simple sugars glucose , fructose, and galactose; the disaccharides maltose, lactose, and sucrose; and the complex carbohydrates or polysaccharides , which are glycogen in human tissues and cellulose (fiber) and starch in plant tissues. Lipids provide the body with more stored energy than carbohydrates do. They are also important as cell membrane components, steroid hormones , and visual pigments. Adipose tissue, which is mostly stored lipid, provides insulation and protection for the organs. About 95 percent of the body's lipid is in the form of triglycerides (fats). Proteins are chains of amino acids . They are important structural components of cell membranes and the extracellular materials of bones, tendons, and other connective tissues , and all muscle contraction results from the action of proteins. Proteins also function as hormones , enzymes , and antibodies. Water makes up most of the body. It is the body's major solvent, and it serves in lubrication, temperature control, and waste removal. A water deficiency can kill more quickly than a deficiency of any other nutrient. Vitamins serve a wide variety of functions in enabling enzymes to work (thus contributing to the synthesis of the body), and in vision, immunity, protection from harmful free radicals, and absorption of other nutrients. The fat-soluble vitamins (A, D, E, and K) are absorbed with dietary fat and stored mainly in the liver. Water-soluble vitamins (vitamin C and the B vitamins) are not stored in the body (except for vitamin B12), since they mix freely with the body fluids and are quickly excreted by the kidneys. Minerals are chemical elements such as sodium, potassium, chlorine, calcium, iron, magnesium, manganese, and phosphorus. They come ultimately from the soil and pass up the food chain from plants to humans. Some minerals serve as electrolytes —salts that dissociate in water to from charged particles (ions), whose movements through cell membranes produce nerve signals and muscle contractions (including the heartbeat). Minerals have a major effect on osmosis and thus strongly affect the body's water balance. They act as co-factors that enable many enzymes to function. Calcium and phosphorus are important components of bones and teeth. Phosphorus is also a part of deoxyribonucleic acid (DNA), ribonucleic acid (RNA), adenosine triphosphate (ATP), and the phospholipids that compose cell membranes. Iodine is needed to make thyroid hormone, and iron to make hemoglobin . Good nutrition hinges on the senses of hunger and thirst, which are both controlled by centers in the hypothalamus of the brain. Thirst is triggered by dehydration and hunger by a low blood glucose concentration. Long-term satiety (satisfaction) of thirst and hunger results when the water and glucose content of the blood return to normal. The hypothalamus thus regulates eating and drinking patterns, although these are also subject to factors such as habit, stress, time of day, social obligations, and availability of food and drink. The food pyramid is a chart of the relative amounts of different food categories recommended for a healthy daily diet. International Food Information Council. <http://ificinfo.health.org> . Johnson, Rachel, and Eileen Kennedy. "The 2000 Dietary Guidelines for Americans: What Are the Changes and Why Were They Made?" Journal of the American Dietetic Association 100, no. 7 (2000): 769–774. Lachance, Paul A. 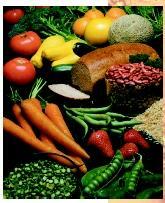 "Overview of Key Nutrients: Micronutrient Aspects." Nutrition Reviews 56, no. 4 (98): 534–539. U.S. Department of Agriculture. <http://www.nal.usda.gov:8001/py/pmap.htm> . Explains the food pyramid as a guideline for good nutrition. Wardlaw, Gordon, and Paul Insel. Perspectives in Nutrition. St Louis, MO: Mosby, 1993.